Both fragrances were created under the direction of Christopher Chong (if you don’t follow him on Twitter you absolutely should, he can be found @cchonguk), and as usual they are both similar in the grand Amouage style, but at the same time they are both remarkably different. When I first saw the press release for Honour Woman I knew straight away that I was going to love it. I’m a massive fan of white florals, I love the duality of cleanliness and outrageous raunchiness that they can convey and I always thought Amouage would do great things with a white floral. 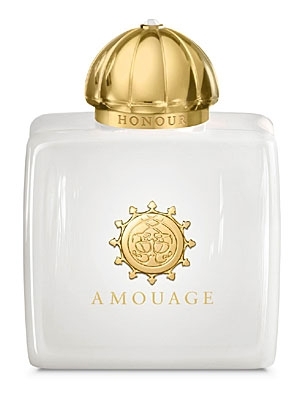 With Honour Woman Amouage does not disappoint. 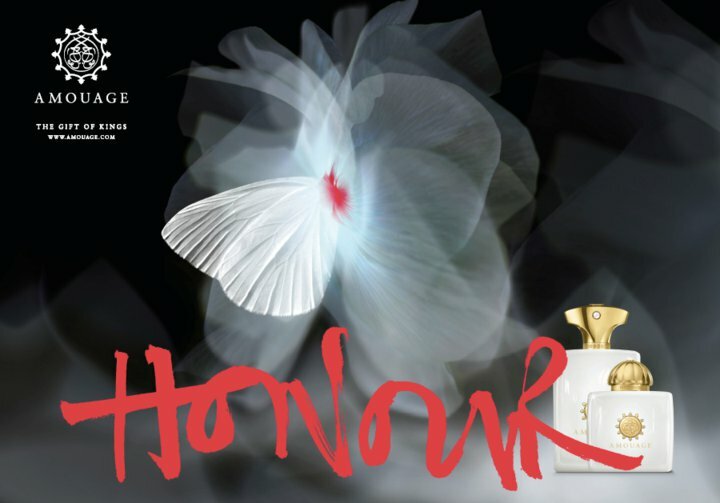 Honour Woman opens on sweet and spicy green notes, it’s a rather subdued and soft opening for an Amouage scent but wonderful nonetheless. The opening feels cool and there appears to be a touch of menthol lurking in the background. Rhubarb leaves give the top notes a green, pollen like sourness that compliments the sweeter notes. The florals in the heart are so well blended that each flower shows it’s signature facet at different times during Honour Woman’s development. The dry green of jasmine, the hot rubberiness of tuberose, the mushroomy cold of gardenia and the sharp sweetness of lily of the valley all appear separately but together they convey a beautiful floral creaminess that keeps this perfumista’s nose pressed firmly against his wrist. Honour Woman has a surprisingly warm base considering it’s cool start. Amouage’s signature frankincense appears shimmering and golden throughout the base. The frankincense is a perfect pairing for the florals and a nice dose of sandalwood rounds everything off wonderfully. I wouldn’t class Honour Woman as a loud scent but it certainly does have presence, I found that it is one of those fragrances that envelops you with an aura, it’s always there throughout the day instilling a feeling of serenity and peace. This is one of those fragrances that I could potentially wax lyrical about how much I love it for hours on end but instead I shall move on. I had high expectations for Honour Man seeing as I absolutely adored the dark, brooding nature of Memoir Man. I wouldn’t go as far as saying that I am disappointed by Honour Man but I don’t really like it either. Honour Man opens with an intense barrage of pepper so dry that it feels as if all of the moisture has been sucked from the air. The harshness of the pepper softens quickly and a few light citrus notes (lime I think) start to lurk in the background. The elemi reigns throughout much of Honour Man’s development and it manages to brighten up what is a rather stark and dry composition. Honour Man is a very woody fragrance and it displays a really high quality cedarwood note, you won’t find any pencil shavings here! Honour Man is a fairly linear scent, but after a good few hours the woody-dryness finally relents and the frankincense and tonka start to peek through and I can’t help but wish that they could show themselves a bit earlier for the sake of balance. You can tell that Honour Man is a high quality fragrance, the ingredients, as always with Amouage, are of exceptional quality. That said, Honour Man failed to wow me, I have smelled designer scents that smell quite similar (for some reason B*Men by Thierry Mugler sticks out in my mind) and it certainly doesn’t match up to the likes of other Amouage masculines such as Memoir and Gold. I think it would be fair to say that Honour Man is not my type of scent at all, however my boyfriend absolutely adores it and it smells good on him. Different strokes for different folks as they say! Both Honour Man and Honour Woman are available in 50ml and 100ml eau de parfum. Prices range from £120-£150 for Honour Woman and £110-£140 for Honour Man. 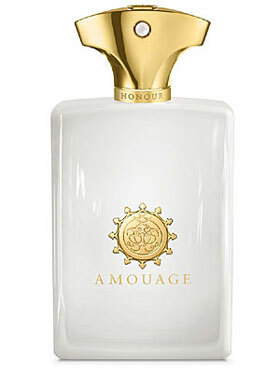 Amouage fragrances can be purchased from a number of high-end retailers such as Escentual, Harrods and Les Senteurs. Both reviews are based on samples provided by Amouage as part of a draw on the blog Cafleurebon. Posted in Amouage, Feminine, Floral, Masculine, Perfume Reviews, Unisex, Woody and tagged 2011 Release, Amouage, Feminine, Honour, Masculine, Niche, White Floral, Woody Incense. Bookmark the permalink. I frickin’ love that film! Honour Woman is the better of the two but I think half of that is down to my personal taste rather than the quality of Honour Man. Interesting, I fell very hard for Honour Man but was unimpressed by Woman (I’m not a big white floral person at all). Man actually reminds me of Opus V, which is my favorite Amouage thus far, so it makes sense that I would love it. Very nice review! I’ve not tried any of the Library Collection, but I’ve heard excellent things about them. Here is one glaring exception to our evil scent twin-dom. I love Honour Woman and am equally unmoved by Man, just as you are. Lovely review! I’m very glad that we have found the exception, Honour Woman is a case of beg, steal or borrow, I must have it! I hope you’re enjoying your holiday! Love the sound of Honour Woman. Menthol rubbery tuberose and sour rubharb leaves and frankincense, mouth is watering! I’m glad to have inspired you! Definitely do try it if you can, it’s a wonderfully creamy white floral, and probably one of my favourites.